Massive damage has been done to Sinharaja World Heritage Rainforest due to construction of an illegal mini-hydro project blocking the Kosgulana River. 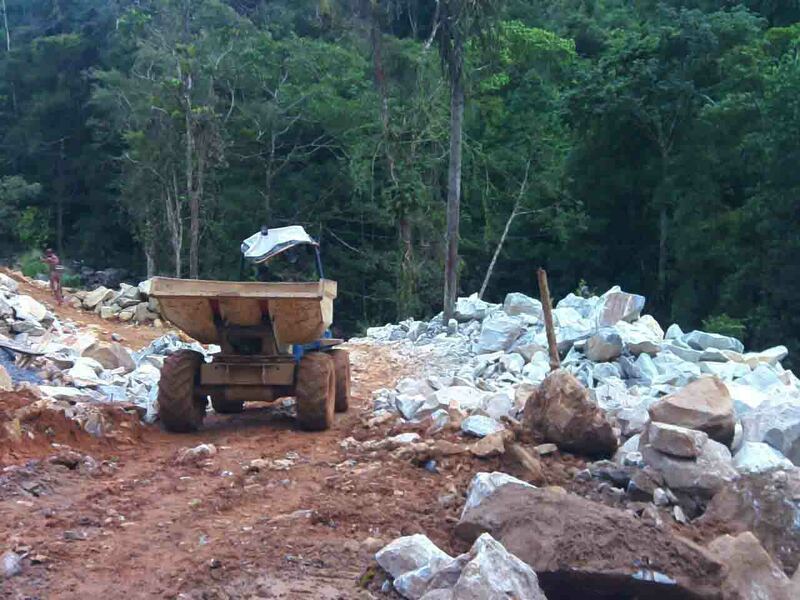 This construction is being carried out in the Northern Sinharaja Rainforest buffer zone at Kosgulana, approximately 4km East from Kudawa main entrance. 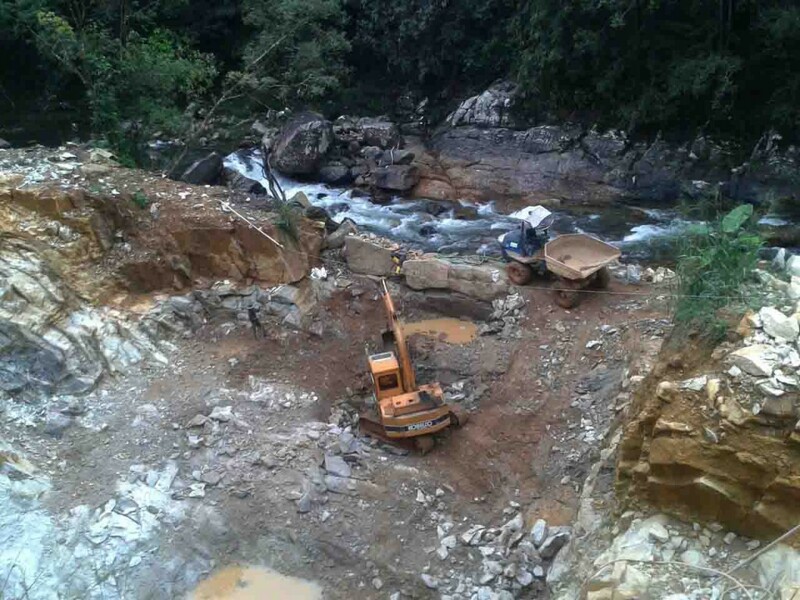 A dam is been built blocking the Kosgulana river in Sinharaja buffer zone and several acres of rainforest cleared by heavy machinery and concrete laid out along the pristine and protected river bank. Large trucks and machinery utilized for this construction has cleared through what was once a small footpath in Sinharaja buffer zone, between Kudawa and Kosgulana. Along this small path to the South is core protected Sinharaja Rainforest and to the North a hilly primary rainforest named Rajuwankanda that is yet to be declared as part of Sinharaja. Due to the footpath being expanded by the heavy trucks, the rainforest has been fragmented with permanent damage already visible. 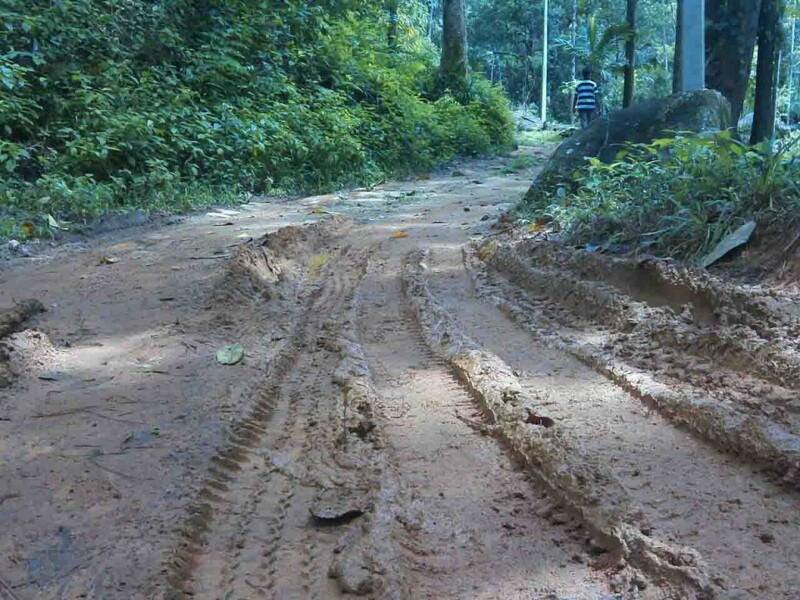 Hundreds of pristine water streams that originate from the hilly Rajuwankanda rainforest and flow towards Kosgulana river through the buffer zone declared by UNESCO has been destroyed by heavy trucks. With such destruction happening just 4 km from the main entrance of Sinharaja World Heritage Rainforest, Forest Conservation Department failure to take appropriate action is questionable. Central Environmental Authority has not done a proper Environmental Impact Assessment (EIA) available for public comment nor information about such a project communicated to respective organizations in charge of protecting Sinharaja World Heritage Rainforest. Questions have been raised about the involvement of these authorities to hide this destructive project from the public. This is the second instance where Central Environmental Authority has allowed destructive mini-hydro projects within a World Heritage Rainforest, after allowing to continue “Eli Hatha” mini-hydro project in Sripada (Central Hills World Heritage Rainforest) in total violation of the Flora and Fauna Protection Ordinance and National Environment Act. These mini-hydro projects generate just a tiny amount of power (approximately 1 to 2 MW) but the destruction to the eco-system is huge. This project violates the environmental laws set forth to protect buffer zones of forest reserves, buffer zones of rivers and UNESCO World Heritage Sites. Therefore, the responsible authorities at Central Environmental Authority, Ministry of Environment and Forest Conservation Department should immediately take action to stop this illegal project and restore the affected area. Failure to take timely action will result in further destruction and total mockery of the environmental laws in Sri Lanka and ruin this UNESCO World Heritage Rainforest. Perpetrators of his crime should be brought to justice. Pristine Sinharaja Forest cannot be reconstituted once it is destroyed and eco system damaged beyond redemption. Mini Hydro Plants destroy the pristine beauty of Sri Lanka and elsewhere bringing only marginal power supply to the grid which in no way can come close to what is required by the rapidly increasing population of Sri Lanka. Power supply by Mini Hydros is just a drop in the ocean compared to the needs of the country. Private company doing the blocking of the River ? Oh dear me ! here comes Ranil’s ultra-Capitalist govt.